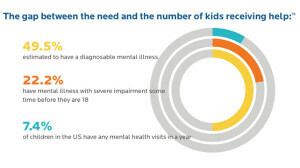 Researchers at the Child Mind Institute say 50 percent of U.S. children will have a diagnosable mental illness, but less than 8 percent will get treatment in any given year. There is a cavernous gap between the number of children struggling with mental health conditions and the number who actually get help. That’s one of the conclusions of the Children’s Health Report released recently by the Child Mind Institute. 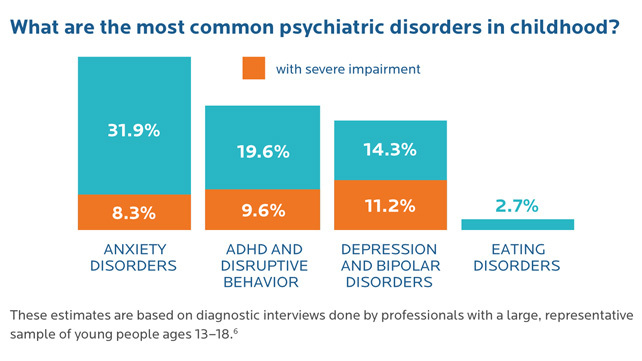 The report states that nearly 50 percent of youth in the United States will have had a diagnosable mental illness at some point during childhood. Of those diagnosed, 22 percent will have a serious impairment. The problem is that not only are these kids not getting care now, they’re not getting care tomorrow, or in five years. Image Attribution: There are many barriers to mental healthcare for families but stigma and misunderstanding are the big ones. Mental health needs are still perceived as something to be ashamed of in the United States. Parents often don’t want to accept that their child may be different either. “If parents were knowledgeable and unafraid, then early and routine mental healthcare would be the norm. It would be expected, training would be adequate, and we would not have shortages of providers,” says Koplewicz. Mental Health Issues Can Start Early: The data show that the median onset for anxiety disorders is 6 years of age. That may be because mental illness and development go hand in hand Koplewicz explained. “It’s possible that, because fear and anxiety are such fundamental functions of the brain, when developmental processes go ‘off course’ in those areas they manifest early,” he said. If your child has frequent, drawn-out, intense episodes of fear, stress, or anxiety that seem out of proportion and affects their daily life and happiness, they may have an anxiety disorder. Other symptoms include trouble sleeping or concentrating, irritability, fatigue, and restlessness. Image Attribution: “Anxiety disorders are real, common, and treatable,” said Koplewicz. “Knowledge is your best friend, and fear and shame have no place when it comes to the health of your child, physical or mental.” The same goes for any mental health concerns, not just anxiety. If you suspect a problem, don’t be afraid to discuss it with your child’s doctor. It boils down to improving your child’s quality of life. “Kids are amazingly resilient if they have the support and the tools to overcome these challenges — but the dangers are real,” warns Koplewicz. You wonder if your kindergartener’s spending long periods of time alone in his room is normal. How many times does your teen have to throw her math book against the wall before you know her problem is not quadratic equations? Your college sophomore stopped texting you—should you worry? Our thoughts and feelings influence our actions—how we perceive ourselves and others, how we communicate, how we learn and mature, and how we face obstacles. 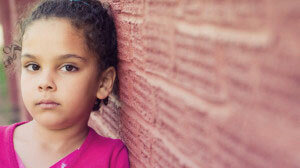 Crises, life transitions, hurts, and other negative forces often can challenge a child’s sense of well-being. The University of Michigan describes a helpful mental health continuum that moves from mental health to mental problems and diagnosable mental illness. Our responses move along this continuum from mild and temporary, to moderate, disabling, long-lasting distress. Famous psychotherapist Alfred Adler once said, “The only normal people are the ones you don’t know very well.” When problems arise in your family, you may be tempted to think the family next door has their act together. But take heart—you know your children best, and it’s their normal that matters most.The opposite temptation is to think your family is the standard for normal. As you might expect, “normal” is a moving target. The mental health continuum is fluid and changeable, depending on how you manage stresses at any given time. Resources: You have probably already equipped yourself for positive parenting by reading books such as Ages & Stages: A Parent’s Guide to Normal Childhood Development(birth to 10 years) or The Teen Years Explained: A Guide to Healthy Adolescent Development. However, there are many other resources to help you lay a strong foundation for your children’s mental health. Contact your child’s school counselors, get support at your local community center, or tap into your local library’s endless supply of knowledge. To access services from our team of independently licensed therapists please call 843-884-0025 to schedule an appointment.